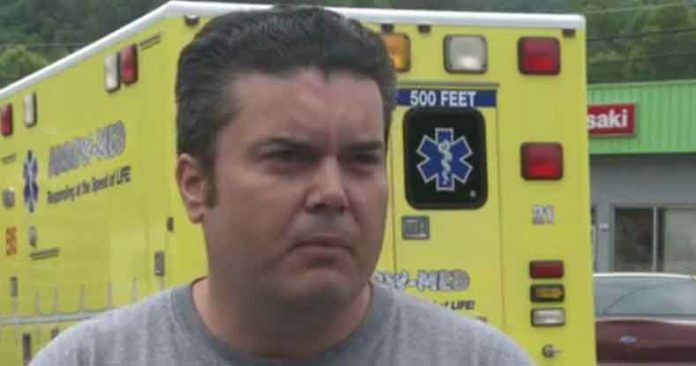 Kentucky taxpayers now owe $26,000 to an EMT after he was wrongfully pulled over by a Sheriff's Deputy who owns a competing ambulance company. Jackson, KY – Most people may see nothing wrong with a town councilman becoming a police offer, but what if that councilman cop also owns an ambulance company, and begins pulling over competing ambulances—then does he have too much power? The answer is still “No” in the city of Jackson, Kentucky, despite the fact that the taxpayer-funded Kentucky Association of Counties is now paying a $26,000 settlement to Emergency Medical Technician Jason Crigger. Crigger filed a lawsuit against Breathitt County Special Deputy and Councilman Steve McIntosh, claiming that McIntosh had no legitimate reason to pull over the ambulance he was driving in June 2016. “Never gave me a reason that he pulled me over….Never accused me of any traffic violations or anything of the sort. It appeared to me he just pulled me over to try to threaten and intimidate us,” Crigger said. This accusation is just the latest in a series of alleged conflicts of interest Crigger claims McIntosh has in his official positions as an officer of the law, a businessman and a town councilman. Mountain News WYMT reported that when one of its reporters attempted to talk to the Jackson city councilman, he refused to be recorded on camera. He did reportedly say that he had good reasons for pulling Crigger over—but refused to say what those reasons were. The two competing ambulance companies have been locked in a series of legal battles. McIntosh is suing Arrow-Med in another lawsuit that alleges the company had defrauded Medicare and Medicaid out of more than $1 million. Crigger is suing for damages related to his “humiliation and suffering, punitive damages against McIntosh and an injunction preventing anyone acting in concert with McIntosh to stop interfering with Arrow-Med,” according to Mountain News. Predictably, Breathitt County Sheriff Ray Clemons told Mountain News he was not aware of any wrongdoing on behalf of his deputy. However, Arrowood says the harassment has been going on for years. As The Free Thought Project has reported, altercations between police officers, EMTS, and even fireman are nothing new. In 2009, Oklahoma Highway Patrol trooper Daniel Martin pulled over ambulance drive Maurice White, choked him, and proceed to arrest him. White objected to being pulled over while transporting a passenger in need of emergency medical care. But that didn’t stop Martin, and his superiors took his side. Not only was Martin allowed to keep his job with the OKHP, but he was later involved in another scandal where he showed an inappropriate photo to another officer. Having a police officer who is also a town councilman is a conflict of interest enough for a sheriff who’s worth his weight in salt to deny employment. But having an officer who owns a competing ambulance company, who then pulls over his competition is a blaring display of both police corruption and political corruption. If Sheriff Clemons is truly concerned with maintaining the public’s trust, he may need to revisit his decision to keep such an officer on the force. In the case of Jackson, Kentucky, while Crigger will receive a $26,000 settlement, the burden to pay the bill is on the taxpayers—not McIntosh, who still remains in his capacity as a sheriff’s deputy.